The SEIKO GENE KRANZ reference 6119-8460 (with silver dial) is known as the watch NASA Flight Director Gene Kranz wore. This exact watch was leased by us to the Television series “For All Mankind”, which is a new series (to be released by Apple) and about to appear. The show imagines what it would be like if we kept on going to the moon. This watch was worn by the Gene Kranz character on the show. The 38mm. case has its original and unpolished finish and looks very fine. 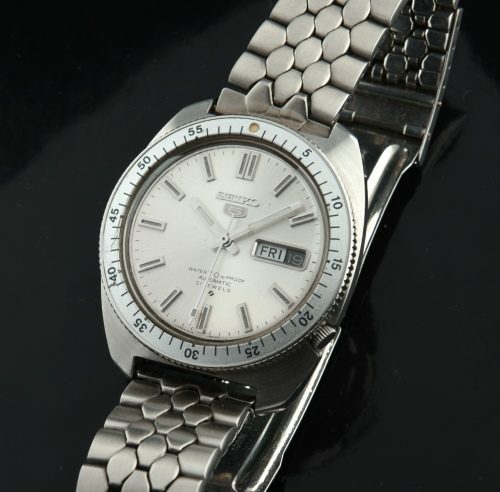 This model is EXTREMELY rare and is has the earliest “proof” dial, instead of the later “resist”. This is the true Gene Kranz watch. The 21 jewel SEIKO movement was cleaned and is accurate. Usually, these bezels are destroyed. This original bezel is well-preserved and only has a few scuffs. The original dial is also fantastic. The hands are original. An expensive generic coffin style bracelet was installed to match the one Gene Kranz wore on this watch. This is a correct and extremely rare GENE KRANZ model that will be appearing on your cable t.v…. and your wrist-at the same time. I would jump on this fast. I may regret selling it.